I’ve started sewing again. David bought me a sewing machine, and I took over a room in the studio for my “craft room”. I like working in the studio because I can hear the girls playing while still having the door shut so they don’t come in and ask me endless questions. David set up a large table in the studio for my sewing machine. So far, my projects have consisted of modifying a doona cover to fit the cot mattress as a fitted sheet, tightening the waist on some of the girls’ pants and hemming an old towel so we can use it as a bath-mat. However, I’ve been taken by the girls’ skirt I saw one day when we were out, and a bit of research showed that it wasn’t too hard to make. 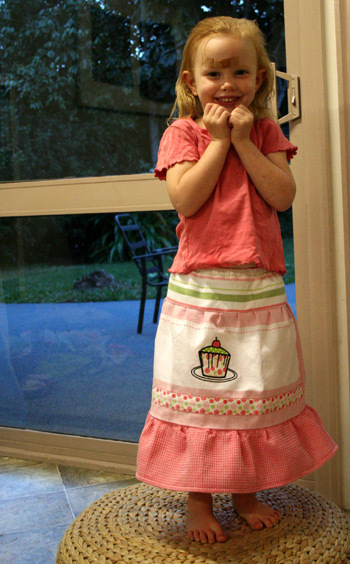 I made a prototype with some spare fabric and followed the directions to make my first multi-tiered skirt. After I gained the confidence, I decided to make one for real. Rather than buying material specifically for this project, I grabbed what I could from the supermarket. 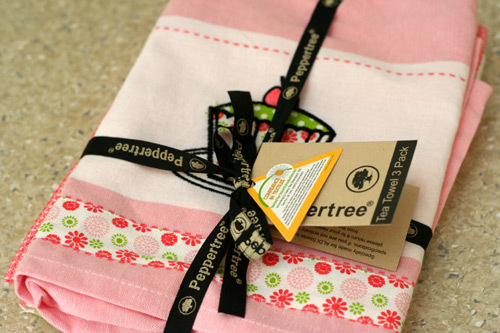 This three-pack of tea-towels was $5 from Aldi. I liked the colours and the cupcake motif. The advantage of starting with tea-towels is that they were already hemmed, and with a bit of clever planning, I could use the hemming to my advantage. 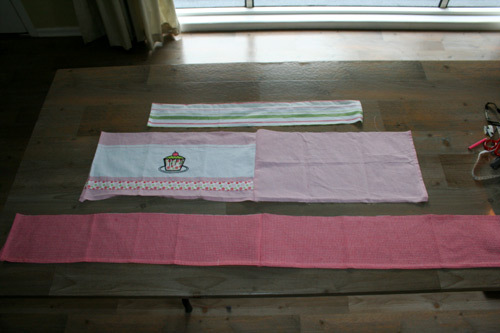 I cut the tea-towels into strips the right sizes. The first step was to create the layers for the skirt. I hand-pleated the second layer to make it the same length as the first layer. There is an easier way to do this, but when working with this fabric, my thread kept snapping, and so I found it was just easier to use the pins to create the gathers that I needed. The easier method worked for the last tier, thank goodness. 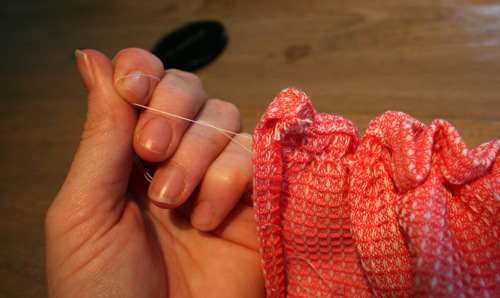 With the third layer, the fabric was thinner and it was possible to bunch the cloth by pulling the bobbin thread tight. When the third layer was the same length as the second tier, I sewed the two pieces together. This project took me less than four hours from start to finish, because I did it in between two of Delaney’s feeds. It took me so long because I foolishly un-picked some of the hems I would later need, and because I’m still a novice with my machine. 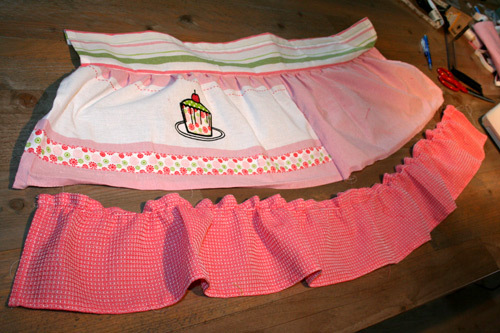 If you added some sewing expertise and took away the kid-wrangling, you could probably do this project in about an hour. It’s really that simple. Of course, when I finished the skirt, my main model (Aisha) was not around, so I tried it first on Calista and then on Brioni. Looks cute. 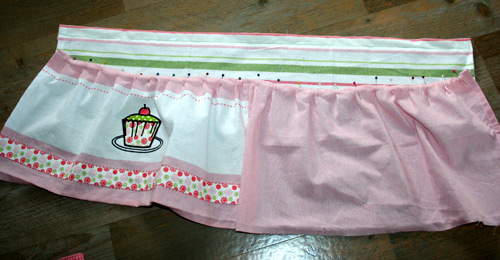 As I made it, the skirt's a bit long for a 3yo, but would be great for sizes 5-7. Very creative, well done you! Thanks, Katrina, for encouraging me in the first place. You’re the one who said it would be pretty easy to make! Just so clever! Wish I could make up a pattern like that! Wow, Lauren! That’s pretty cool. Well,what a kind husband to buy you such a practical gift.Well done with the skirt.Oh,Lauren,there are all sorts of possibilities open to you now and so satisfying! This is PRECIOUS!!! 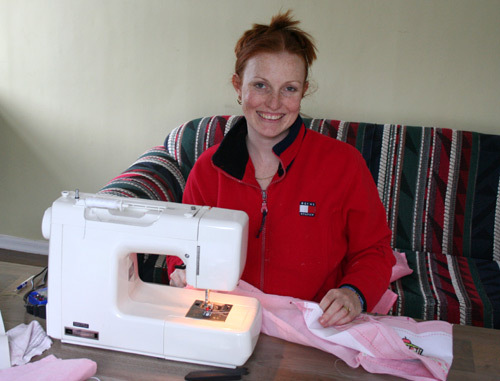 I’ve had a sewing machine for ten years and I’ve never had the courage to try anything like this. It turned out absolutely darling! Great! 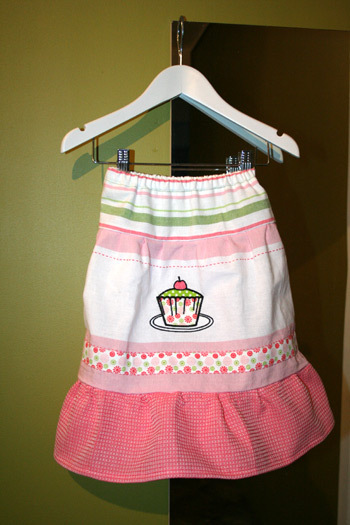 And where else would you get cheap, durable material with just one nice cup cake?